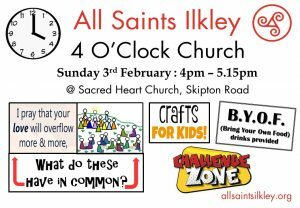 Join us for our next instalment of 4 o’clock church on Sunday 3rd February. We will meet at 4pm at Sacred Heart Church for fun, crafts, worship and a short talk. Bring your own food for after the service! All welcome!